On February 26, Pope Francis received the delegates of Ternopil-Zboriv Archeparchy of the UGCC. They thanked Holy Father for the miraculous icon of Medallion of Edessa, which for 11 days was in Ternopil Cathedral, Ukraine. The arrival of the relic to Ukraine became a symbolic act of support of the Holy See for the Ukrainian people during this difficult time. More than 400 thousand faithful came to honor the holy relic dating back to the times of Jesus. The delegates expressed their gratitude to the Holy Father for prayers and support for the Ukrainian people in these difficult times and presented Holy Father an icon of "The Saviour Not Made by Hands", which was recently written by Mykola Shevchuk. On behalf of Ternopil-Zboriv Archeparchy they also invited the Holy Father to visit Zarvanytsya, Ukraine, which is one the largeest Marian centers in Europe. The Image of Jesus Christ, the Medallion of Edessa, was returned to the Sistine Chapel Papal sacristy in Vatican. 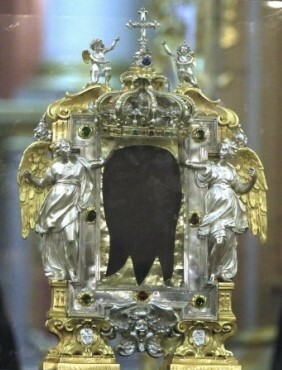 According to Christian tradition, the Image or Medallion of Edessa is a holy relic consisting of a cloth upon which a miraculous image of the Face of Jesus had been imprinted. The king Abgar of Edessa who was seriously ill, believing in Jesus Christ as the Son of God, wrote a letter asking to come and heal him. With the letter, he sent his painter Ananias, instructing him to write the image of Jesus. Ananias was not able to draw an image of Jesus, because his face was like the sun. The Lord asked him to bring water and cloth towel, he washed his face, wiped it with towel and miraculously the imprint of Christ’s face remained on the towel. Ananias brought it back to Edessa and healed Abgar. Later Saint Thaddeus, a disciple of Jesus, the apostle of the 70, came and preached the Gospel and baptized Abgar and all the inhabitants of Edessa.